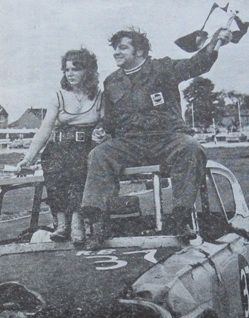 At long last I have managed to obtain limited information in the form of some programme scans on the Stock Car Racing which took place at Motherwell in 1971. I only have results for a few meetings, but hopefully somebody out there has more comprehensive records and I can add them to the site in the future. Due to the fact that I only have few meeting results, I have listed them hereunder rather than in the normal format which incorporates them as separate files at the beginning of each year summary. I have taken the liberty of describing the formula as Saloon Stock Cars. The promoters described them as Hot Rods. The Programmes are really quite poor as far as Stock Car programmes go. The first meeting programme was the only one that carried any sort of narrative at all. They also failed to provide any points chart during the whole season. Grading roof colours were indicated alongside the various drivers names. This is not necessarily the roof colours these drivers achieved at the end of the season, but merely a record that they reached this level during the season at some point. I have indicated these roof colours alongside the relevant drivers. The promoters were also willing to issue the same racing number to various drivers during the season. So all in all it was not a good system for keeping the spectators informed & not confused. From the drivers's list a number of things are worthy of note:- 206 drivers registered to race during the season - a very impressive total starting from scratch and the localities the driving pool came from. You will not find too many Stock Car / Rod drivers racing today from these areas. The plain fact is that it is a great shame there is no Stock Car track in Scotland's most densly populated areas. The Promoters were listed jointly as Ian Hoskins (son of the famous Johnny Hoskins). Ian had been the promoter of Glasgow White City in it's final incarnation when it was affiliated with the Spedeworth organisation. Ian's joint promoter was listed as Elizabeth Kennedy. The Kennedy family had developed the site (which had been the home of the "Motherwell Eagles" in the 50's) and built a Trotting Track, which was the principal dream of Robert Kennedy the developer. 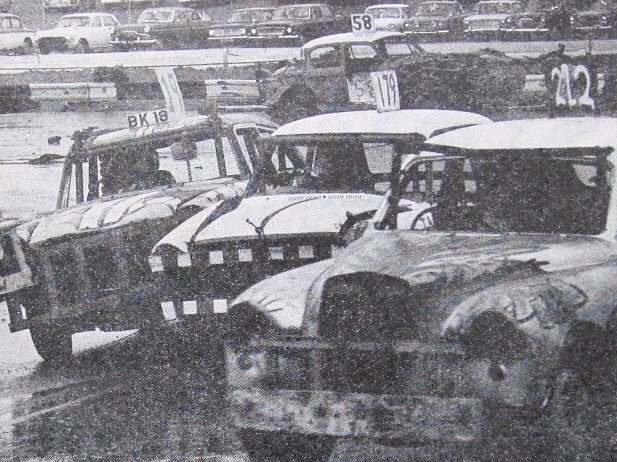 In 1971 Stock Car Racing was added to the use of the site. As I have said above it was Saloon Stock Car racing which was the chosen formula, though it was promoted as Hot Rod Racing. There were also plans to re-introduce Motorcyle Speedway, which did in fact occur, when another track was laid. The Stock Car track length was 420 yards - I believe asphalt. One of the highlights at the track was that you could bring your own vehicle into the stadium and park around the outside of track, they even had a mobile canteen servicing the spectators. 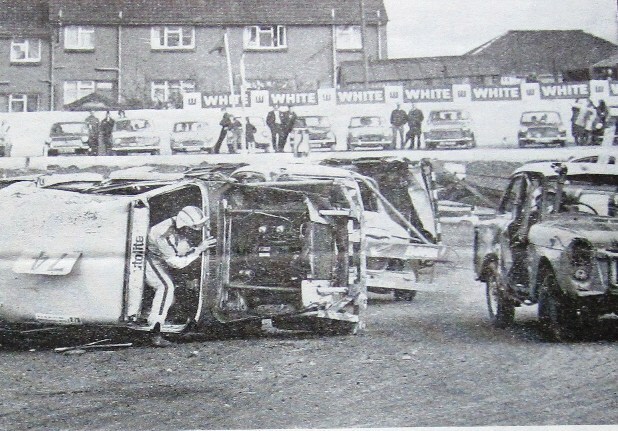 Johnny & Ian Hoskins had introduced Formula Two Stock Car Racing into Scotland at White City Glasgow in 1962. However rather than try and compete with the specials (Superstox) racing at Cowdenbeath, Ian decided to go back to the grass roots style of racing and have the Saloon Stocks, as the formula. The cars were ironed up similarily to that in use at Cowdenbeath. The cars that were allowed however was far more relaxed. 2.4 litre Jaguars mixed it with Austin A40's! 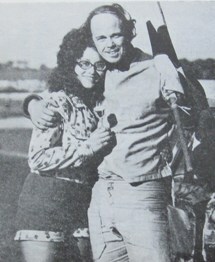 Ian Hoskins also had the role of Clerk of the Course. 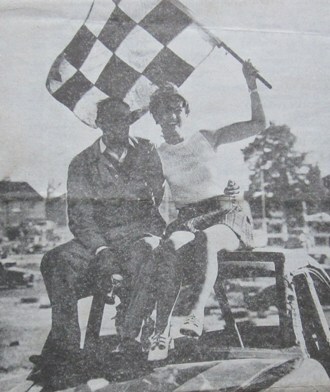 The Racing Manager was Bill Thirkell, Bill had raced F2 at White City & F2 & Superstox at Cowdenbeath. The starter Alan Robertson had carried out this duty as far back as 1954 for Formula One Stock Car Racing at Steppes in Glasgow, but had also seen out duties at White City. You will note from the driver list, that many of the protaganists went on to compete at Cowdenbeath and indeed Newtongrange in later years. "THE WEST of SCOTLAND CHAMPIONSHIP"
Long Time Hot Rod Star Alex Grant - with the smallest trophy EVER! "THE KNIGHT of SPEED TROPHY"
The First Ever World Hot Rod Champion!!! "AUTUMN CLASSIC & LADIES POWDER PUFF"